Booker Taliaferro Washington (April 5, 1856 – November 14, 1915) was an African American political leader, educator and author. He was one of the dominant figures in African American history in the United States from 1890 to 1915. Washington was born into slavery in Franklin County, Virginia. At the age of 9, he was freed from slavery and moved with his family to West Virginia, where he learned to read and write while working at manual labor jobs. At the age of sixteen, he went to Hampton, Virginia to Hampton Normal and Agricultural Institute, now Hampton University, to train as a teacher. In 1881, he was named as the first leader of the Tuskegee Institute in Alabama. He was granted an honorary Masters of Arts degree from Harvard University in 1896 and an honorary Doctorate degree from Dartmouth College in 1901. Washington received national prominence for his famous Atlanta Address of 1895, attracting the attention of politicians and the public as a popular spokesperson for African American citizens. Although labeled by some activists as an "accommodator", his work cooperating with white people and enlisting the support of wealthy philanthropists helped raise funds to establish and operate hundreds of small community schools and institutions of higher education for the betterment of black persons throughout the South. In addition to the substantial contributions in the field of education, Dr. Washington did much to improve the overall friendship and working relationship between the races in the United States. His autobiography, Up From Slavery, first published in 1901, is still widely read. 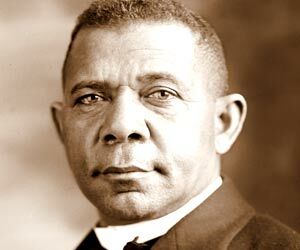 (Learn more about Booker T. Washington).